After an initially estimated 3 week project, some 15 weeks later the ticket interface is here and loaded with new features to simplify giving and receiving support. First, the WYSIWYG editor features limited support for HTML, in addition to BBCode ([code], [b], [i], [url]). Priority, subject, and contacts can be modified at any time. 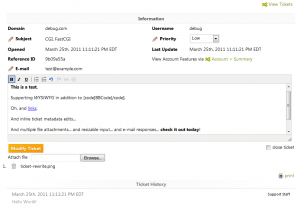 Contacts autocomplete using e-mail contacts from prior tickets. An unlimited number of attachments can be attached to a ticket, so long as it’s within 10 MB. Tickets can be printed easily for your personal record. 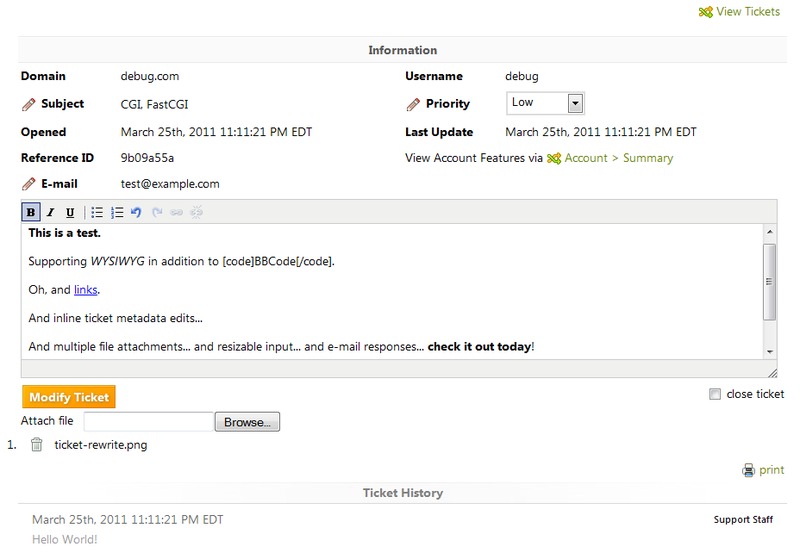 On the other side, ticket e-mails can be replied to directly, posting a copy within the control panel. Attachments included in a response are likewise posted to the CP as if submitted via the CP UI. Less prominent features include SSL webmail, improved tooltip performance, and domain renames in Addon Domains.